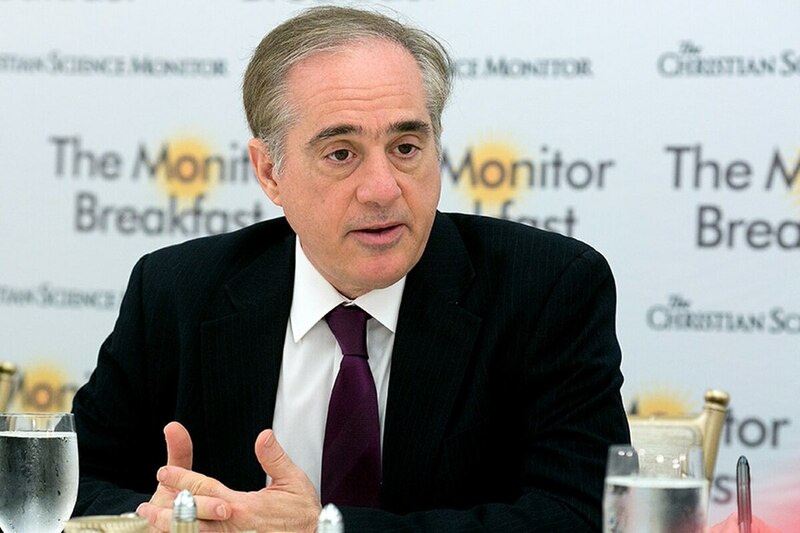 WASHINGTON — Future Veterans Affairs clinics could feature fewer maternity services, fewer cancer specialists and more reliance on private-sector clinics for routine or non-military care, under Secretary David Shulkin's vision for the department. But he insists that doesn't amount to privatization of VA's responsibilities. "I am interested in building world-class services in things I know the veterans of this country must rely upon us for," he told reporters at a roundtable event Tuesday morning. "I'm not interested in building world-class services that already exist." "We don't have enough resources to do everything. So let's build an integrated system that relies on what already exists in the private sector with what needs to be enhanced in the VA."
For months, Shulkin and top congressional Republicans have insisted that criticisms their plans would "privatize" VA services are unfounded, and that the $180 billion-plus department will not be slowly dismantled in favor of commercial medical options. But veterans groups in recent days have criticized a number of pending plans they say will diminish VA's position as a robust health care system for former service members. In particular, they’re taking issue with department plans to expand the controversial Choice program, which allows veterans to see private sector doctors at government cost if they face delays in getting VA care. Last week, in Senate testimony, Vietnam Veterans of America National President John Rowan criticized the preliminary details of the plan as "a false choice" that will add "layers of bureaucracy and cost" without improving care. Carlos Fuentes, director of national legislative services for the Veterans of Foreign Wars, said the idea "could possibly lead to the gradual erosion of the VA health care system." But Shulkin on Tuesday repeated that offering more choice to veterans is one of his top priorities for VA, along with eliminating duplicative services and combating veterans suicide. "We are increasingly seeing more veterans who are pregnant, since women are our fastest growing demographics," he said. "You don’t hear me suggesting we should be building maternity floors and neonatal intensive care units. Frankly, that exists already in the private sector." Those comments seem to run contrary to those of his predecessor, former VA Secretary Bob McDonald, who during Barack Obama’s presidency promised to expand services for female veterans. Shulkin also said regional assessments are already underway to identify gaps in services and strengths of community offerings. "If you’re in an area where there are strong cancer or kidney dialysis services, then you will take advantage of what the private sector has," he said. "If you already have strong services within VA, then you won’t be buying as much of those (private) services." The VA secretary downplayed questions about a broader philosophy from President Trump’s administration to privatize a range of government offerings, saying there is no political coordination between departments to find ways to shift tax money outside of government programs. "This is not a move towards privatization," he said. "This is a move to help veterans." He said VA needs to excel in "the services that veterans must rely upon it for. If you just turn our veterans over to the private sector, they would not find the experience in issues such as PTSD, TBI, in complex rehabilitative needs, in prosthetics and orthopedics, in spinal injuries, in behavioral health care in general." Shulkin is expected to unveil more details of his planned Choice program revamp — already named the Veterans Coordinated Access and Rewarding Experiences program (Vets CARE) — in coming weeks. Meanwhile, department officials last week announced that the existing Choice program is on pace to run out of money in August, months ahead of schedule. Shulkin has petitioned lawmakers to free up money in other accounts earmarked for later this summer, to avoid major disruptions in thousands of veterans’ medical care. But critics are already pointing to the problem as evidence that moving veterans outside of VA care will not solve long-term access and cost issues.